Brad Householder, Founder and CEO of b2i, spoke at the ToolsGroup TG18 user conference recently and presented an innovative approach to strategically analyze your value chain to focus digital investments. Brad, by the way, comes from a great pedigree. Prior to founding b2i, he was a leader in PwC Advisory's Operations and Supply Chain Management practice, and he is the 2018 chairman of the board of directors for APICS. The starting point for this discussion is that executives at leading companies are moving from asking “What can we do to transform our supply chain?” to “How can we use our supply chain to disrupt our industry?” Brad’s recommendation is to take a broader, more strategic perspective and look at your overall value chain to see where your best opportunities lie. Brad uses the term “Disruptive Collaboration” to refer to this strategic approach to identifying and exploiting disruption. Here is the three step process he describes. First, map out the full value chain for your industry. One of Brad’s key messages is that your supply chain and your value chain are not the same. Supplies chains are about the flow of materials and information, and require objectives like efficiency, speed, and precision. In value chains, it’s all about the money. The driving objectives are market share and profit. Supply chains should be collaborative. Value chains strain collaboration as companies seek to grab larger slices of the profit pie. As Brad points out, supply chain partners are often value chain competitors. Think Intel, Microsoft and Dell. They partner in the end to end supply chain, but they often fiercely compete with each other a larger share of overall industry profits. 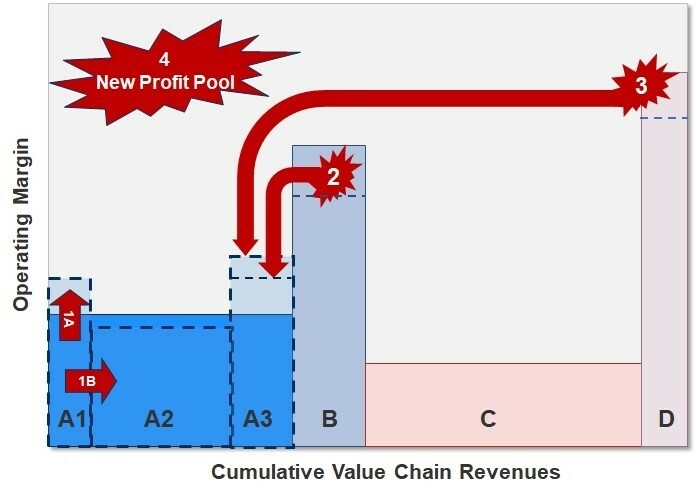 A “profit pool” map is an effective way to quickly assess the overall structure of a value chain. It’s accomplished by lining up the individual industry segments, from n-tier suppliers to end consumers, with each box representing the cumulative revenues (horizontal access) and the operating profit (vertical access) of each segment. 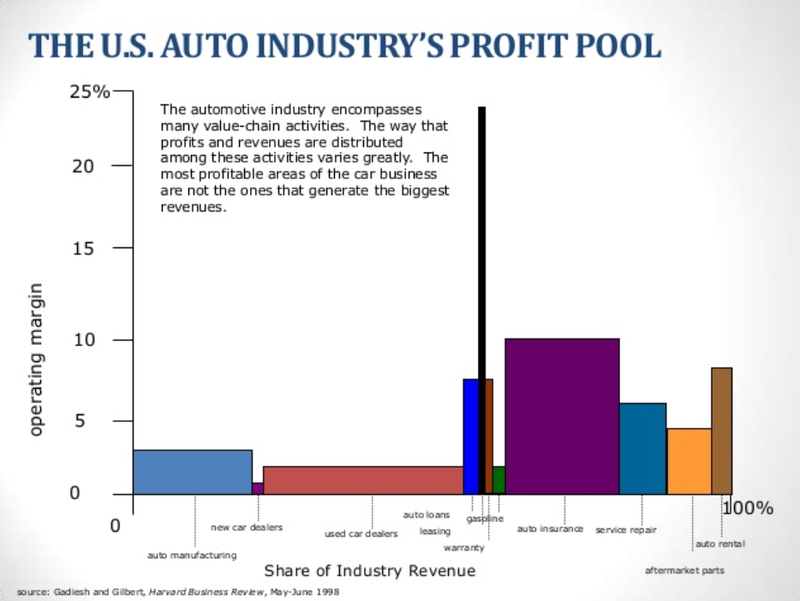 The example above shows a profit pool view of the value chain of the automobile industry. Tall narrow boxes, like leasing, represent small, high-margin businesses. Short and wide boxes, like auto manufacturing represent large, lower-margin segments. Brad says that in industries that have mostly public companies, these numbers are generally not hard to obtain, especially since they don’t need to be precise. The goal is to create a visual image of the industry that illustrates where the overall revenues and profits are found. It allows your company to understand the value drivers for the whole industry value chain, not just your own market sector. Plays 1A and 1B within a segment are straightforward, traditional competitive strategy approaches, but this chart can be most helpful when considering the bigger industry picture of plays across segments. An example of this would be an electronics contract manufacturer like Jabil or Foxconn offering a suite of advanced manufacturing engineering, design, and prototyping services to startup electronics companies. The third step is to evaluate new technologies through the specific lens of their potential to enable plays 3 or 4 and dramatically alter the profit pool. Brad notes that the current boom of digital technologiesoffer new ways to connect more closely to the needs of the end consumers, regardless of your actual position along the supply chain. These new connections enable data flows that, if properly exploited, create “information asymmetries” that can be source of new value-added features or capabilities. The explosion of new asset sharing and disintermediation models, like Uber or Airbnb, are perfect examples of this, he says. For more information on this topic you can reach Brad at bsquared.ideas@gmail.com.